We are so excited to share with you that the incredibly avant garde mannequin company, La Rosa has an exhibition which has just recently launched. The 'anthological exhibition ManneQUEEN, since 1922 [is] showcasing the history of La Rosa, Milan'. This incredibly exciting exhibition not only looks at how the human form has changed over the last century but also the impact that it has had on society including the influences of surrealism, realism etc. This is certainly one of the most important exhibitions of our industry so far in this 21st Century and has been organised by La Rosa in conjunction with Fundacion Cristobal Balenciaga in Milan; curated by Gigi Rigamonti. We are keeping our fingers crossed that it will tour and hopefully the company have plans to show in London and New York. 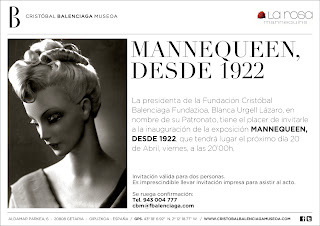 The exhibition runs until 15th July 2012 at the Cristobal Balenciaga Museoa, Aldamar Parkea, 6 Getaria. You must go and see this even if it is the only thing you do this year.